Duro-Seel Clear is an acrylic/rubber co-polymer low lustre, non-aqueous solvent resin based lacquer surface coating. It provides a high performance protective coating for exterior and interior concrete and other mineral based materials. • an efficient, time saving clear curing compound for easy brush, soft broom or suitable spray application to freshly placed, finished and ‘just set’ concrete, mortar and other cement bound surfaces. • applied uniformly and carefully so as not to damage the fresh concrete by brush, soft broom or long knap roller, a single coat of Duro-Seel Clear curing compound at the recommended coverage rate of 4-5m2/litre forms a uniform film. This coating film having high resistance to moisture vapour transmission, prevents evaporation of the concrete’s mix water to allow continuing hydration of the cement binder. This important curing procedure ensures maximum hardness, strength development and durability of the concrete in place. It also ensures a sound base for subsequent coatings. A second coat of Duro-Seel Clear or one or two coats of colored Dy-On-Crete® Mark 2 may be later applied over the curing compound coat for an ideally cured and sealed project. This time saving system eliminates the need to thoroughly prepare existing concrete for coating applications. 2. A protective coating for existing hardened concrete to protect and seal it. This clear ‘paint’ or surface coating features high penetration and adhesion, but is not available in colours. For coloured coatings please note that Dy-On-Crete® Mark 2 is available in 12 colours. Duro-Seel Clear is a robust, clear coating finish formulated from a special grade of acrylic resin polymer co-polymerised with a special flexible, high adhesion water repellent synthetic rubber polymer. 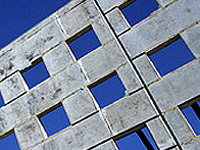 Applied with a minimum of two (2) coats or layers, the product’s early water resistance and adhesive strength are features that has made it an famous reliable material for exterior protective clear applications on existing set, hardened, cast-in-place concrete, concrete roofing tiles, concrete blockwork, baked clay brickwork walls and other existing cement bound products and materials. The combination of a suitable rubber polymer to give high adhesion, watertightness and flexibility, combined with the high water resistance, high UV resistance and hardness of a suitable acrylic polymer to form during the co-polymer manufacture (co-polymerisation) has been found to exhibit over a 22 year period since its initial manufacture, superior reliable performance compared with a suitable 100% acrylic polymer alone. Duro-Seel Clear, like all clear resin coatings, is chemically organic and being clear without UV radiation absorbing and dissipating ultra-fine grain abilox® type inorganic colouring pigments, is therefore eventually degraded by UV rays from sunlight. This polymeric product with at least two (2) coats or layers and preferably one more, applied to freshly finished or to existing concrete to result in the minimum recommended total dry film thickness (dft) of 200mm, forms a protective coating that exhibits a worthwhile level of resistance to micro crazing and ‘yellowing’ which are both adverse characteristics commonly associated with exterior clear finishes. Duro-Seel Clear has performed well over many years of exterior exposure and although, like all normal resin-based coatings, the gloss level is reduced proportionally to the degree of weathering the coating may sustain, it has maintained its original clean, clear depth of low lustre when exposed to direct sunlight for a remarkably long period of time. The application of two (2) coats of Duro-Seel Clear to the surfaces of concrete substrates - including situations where the first coat is applied as a curing compound to freshly finished and set concrete - provides a waterrepelling zone on the surface to which it is applied such as cast-in-place concrete. The product’s water repelling seal assists in reducing the possibility of efflorescence (white crystalline salt bloom) occurring on the concrete’s surface, and when fully dry, it exhibits good resistance to dirt pick-up when exposed to environmental contaminants. Two (2) coats of Duro-Seel Clear applied typically at 5-6m2 per litre gives a low sheen finish to existing Normal N25 grade concrete having a compressive strength of 25 megapascals (MPa) at 28 days. A further coat will increase the gloss level and make this coating last longer. For application to existing hardened concrete / mortars etc. It is better to apply multiple thin coats rather than one thick coat, especially if applying the product in cool and/or damp, high humidity conditions. Remember, except when applying Duro-Seel Clear as a curing compound, ‘thick’ is only better when made up by a number of thinner application coats. Make sure that the first coat is completely dry before applying the highly recommended 2nd or 3rd coat to build up to the recommended ‘dry film thickness’ (dft) of 200μm. Ensure all existing set/hardened surfaces are sound, firm, clean, dry and free of contaminants. Good surface preparation can be performed by approved cleaning and surface preparation methods for painting such as minimum 3,000 psi pressure washing with a ‘Gerni’ type machine, as well as power scabbelling, scraping, sanding all of which will remove laitance - a weak surface layer on concrete and for light contamination only - scrubbing (with painters ‘sugar soap’ and thoroughly rinsing with clean, drinkable water), then allowing the surface to properly dry. In this way you can ensure the surface is completely free of any grease, oils, silicones, other contaminants and dry to thus eliminate any possible adhesion failure. Duro-Seel Clear may be brushed, rolled or sprayed with suitable painting equipment to dry surfaces. For application with pressure spraying equipment, evaluate the use of a number 518 tip. For the best durability, Duro-Seel Clear should be applied in multiple coats to the recommended minimum total dft (dry film thickness) finish, allowing the product to properly dry between coats, with the coverage rate typically being 5-6m2 per litre per coat. Avoid contact with skin and eyes. Use only in well ventilated areas. Avoid inhaling solvent vapours. Always use suitable nose/mouth mask or respirator during all, and particularly spray applications. Please refer to the Duro-Seel Clear MSDS. Duro-Seel Clear is an easy-to-apply and efficient curing compound for cement bound surfaces that are just about to set. Apply a single thick coat of Duro-Seel Clear at a coverage rate of 4m2- 6m2 per litre to newly finished cement bound materials when they are nearly set to cover by means of a soft broom, long-nap roller or knapsack spraying unit all surfaces exposed to the air. This is best done just PRIOR to or at the latest IMMEDIATELY after the concrete sets. A further sealing coat of Duro-Seel Clear or coloured Dy-On-Crete® Mark 2 liquid coating may be applied in 1-3 days time. Ask Ability for information about this important curing procedure for all cement bound materials. Read and study the data entitled ‘How to Reduce Cracking and Shrinkage Movement in Concrete’ and ‘All Concrete Needs Curing’. A free, no charge, sample of Duro-Seel Clear for testing is provided upon request. This should be tested and evaluated to determine completely its suitability for the intended use. The technical data furnished herein is based upon data believed by Ability Building Chemicals Co to be true and accurate at the time of its preparation. However, no guarantee of its accuracy is given or implied and it is subject to change without notice. It is given in good faith for the assistance of users.